A thoughtfully maintained and designed work environment is a great way to market your business, while showing your clients and employees that you take pride in your company and you care about the customer experience. Selecting your artwork is the first step, but certainly not the last. Installing artwork is not always as easy as it may appear. Consider the amount of time and money invested in selecting your artwork. Improperly installed artwork may detract from your overall goal and cost you more time and money. When your artwork installation is complex, DIY can lead to wasted time, frustration, or even damaged artwork. While most general contractors are familiar with installing products, unless they are trained on the nuances of installing all types of artwork, you should consult an experienced art installation professional. Various art substrates require different hanging applications. Simply asking anyone to install an acrylic art piece for example, could lead to unsightly cracks if the hardware was fastened too tightly. 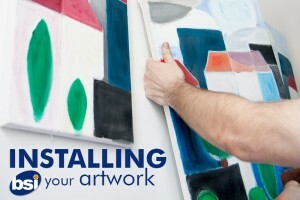 Large artwork installations require a coordinated plan for each piece prior to installing. It is helpful to lay out the artwork ahead of time so you can see how each piece looks together. Once you have determined the locations for each piece of art, code each location on the floor plan. Then label the back of each art piece with the specific location code used on the floor plan. It is then simply a matter of using the floor plan and labels to assign each piece of art to its proper location. Without a well-formulated plan like this you can generate a lot of confusion and extra work. This entry was posted in Artwork & Accessories. Bookmark the permalink.